After piecing together the global smartphone shares, it’s time to take a look at global mobile phone shares. That’s all phones from all vendors that matter. Unfortunately, just like there are only fragments available from Canalys about smartphones, there are only partial lists from IDC (IDC – Press Release – prUS22441510). Missing are numbers from Apple, Motorola and HTC. But fear not, those can be obtained from company earnings reports. 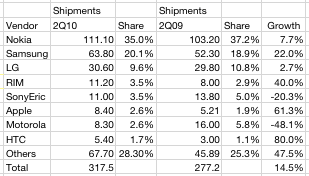 The pure play smartphone vendors (HTC, Apple and RIM) are growing rapidly and capturing most of the profits. 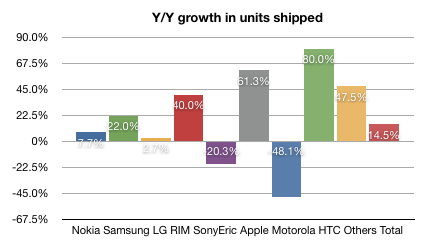 LG and Samsung are taking share from Nokia but losing margins. “others” are doing well at the low end. 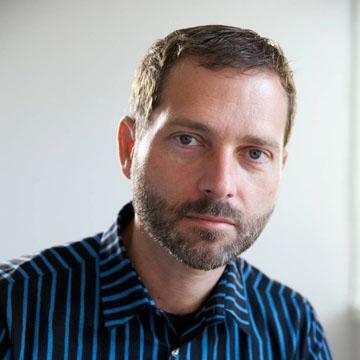 Sony Ericsson and Motorola are transitioning from mass market vendors of commodity voice products to niche vendors of Android commodity data products.